Www.spice-rtn.org Mid-Term Review Meeting, February 13-14, Tutzing Seismic wave Propagation and Imaging in Complex media: a European network IVO OPRSAL. 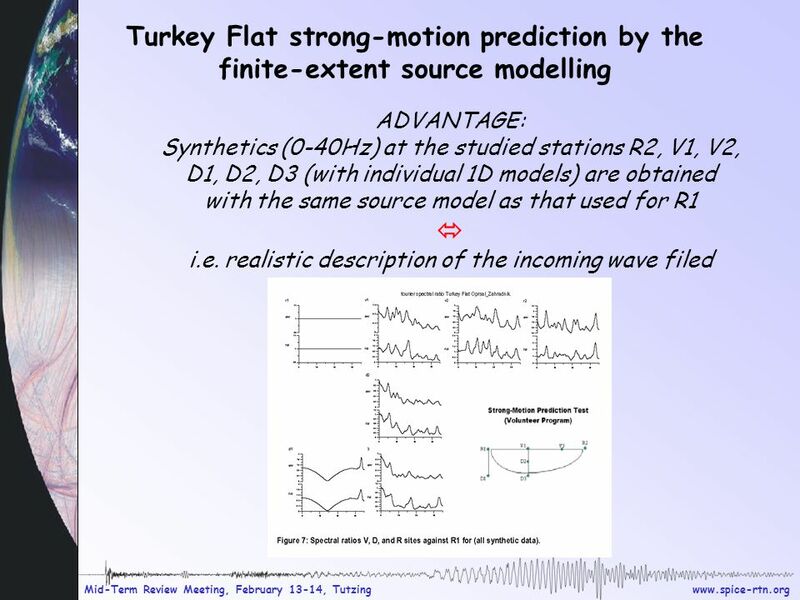 6 www.spice-rtn.org Mid-Term Review Meeting, February 13-14, Tutzing Turkey Flat strong-motion prediction by the finite-extent source modelling Usual approach is to focus on local site effects while the excitation is represented by plane incident waves. Composite-source method using a non-uniform fault slip distribution (Ji, 2005) is applied to all stations. We emphasise the source effect. 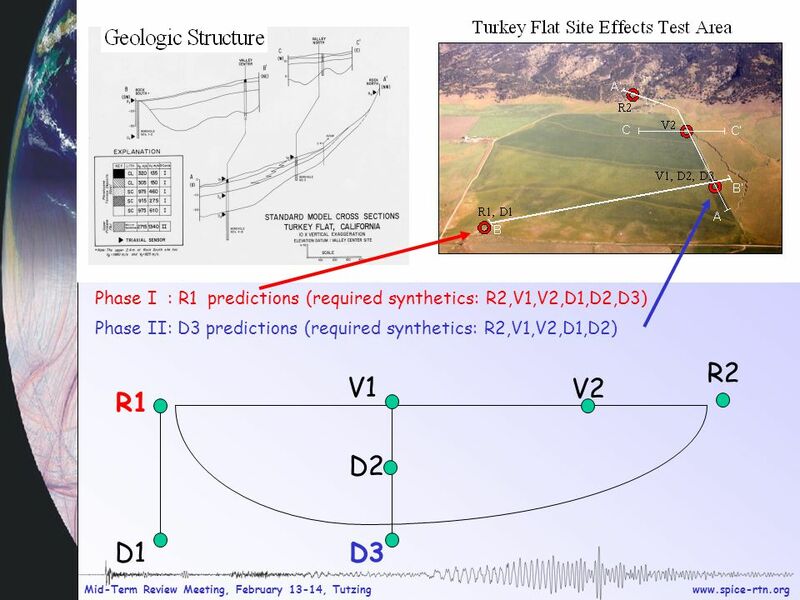 The reason is that: Firstly, the studied stations (R2, V1, V2, D1, D2, D3) are inside or around a very shallow stiff-soil sedimentary valley (local effects can be treated using individual 1D models below each receiver). Secondly, the dimensions of the ruptured area (W x L = 15 x 40 km, M6) are too large to be approximated by a planar wave. 11 www.spice-rtn.org Mid-Term Review Meeting, February 13-14, Tutzing Availability of D3 record did not require any additional change. 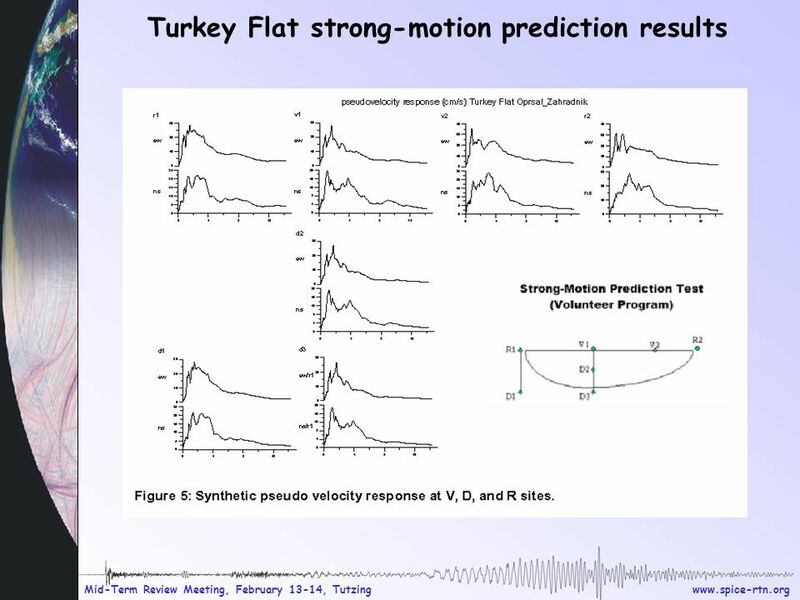 This is an a posteriori justification of the approach Turkey Flat strong motion Prediction, PHASE II NO MORE WORK NEEDED ! 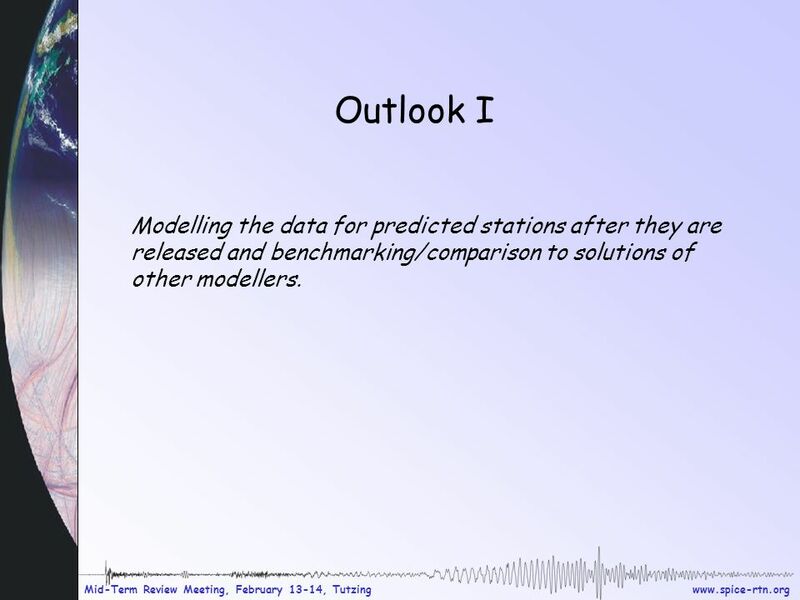 12 www.spice-rtn.org Mid-Term Review Meeting, February 13-14, Tutzing Outlook I Modelling the data for predicted stations after they are released and benchmarking/comparison to solutions of other modellers. 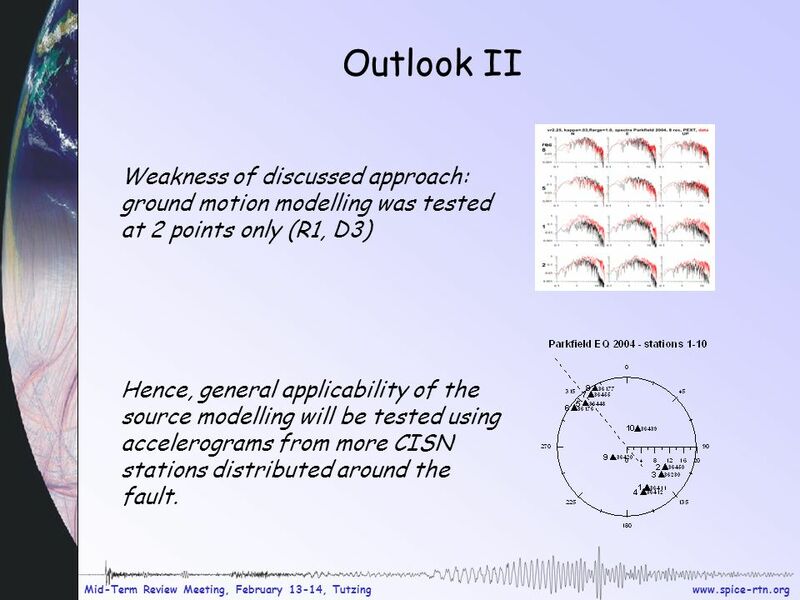 13 www.spice-rtn.org Mid-Term Review Meeting, February 13-14, Tutzing Outlook II Weakness of discussed approach: ground motion modelling was tested at 2 points only (R1, D3) Hence, general applicability of the source modelling will be tested using accelerograms from more CISN stations distributed around the fault. 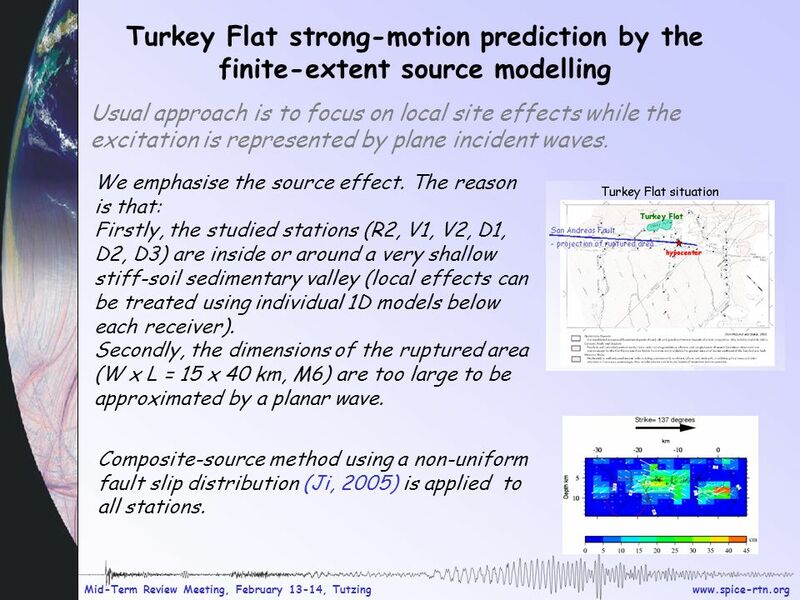 Download ppt "Www.spice-rtn.org Mid-Term Review Meeting, February 13-14, Tutzing Seismic wave Propagation and Imaging in Complex media: a European network IVO OPRSAL." 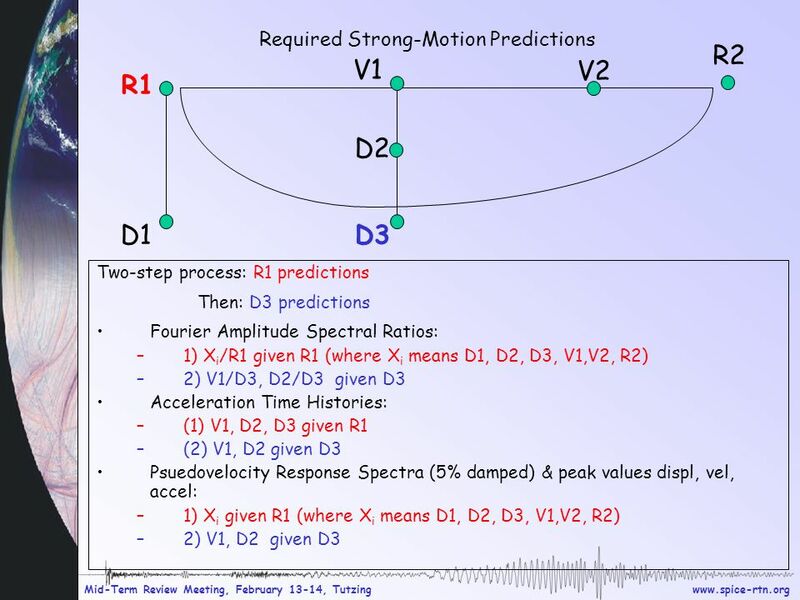 Fast determination of earthquake source parameters from strong motion records: Mw, focal mechanism, slip distribution B. Delouis, J. Charlety, and M. Vallée. 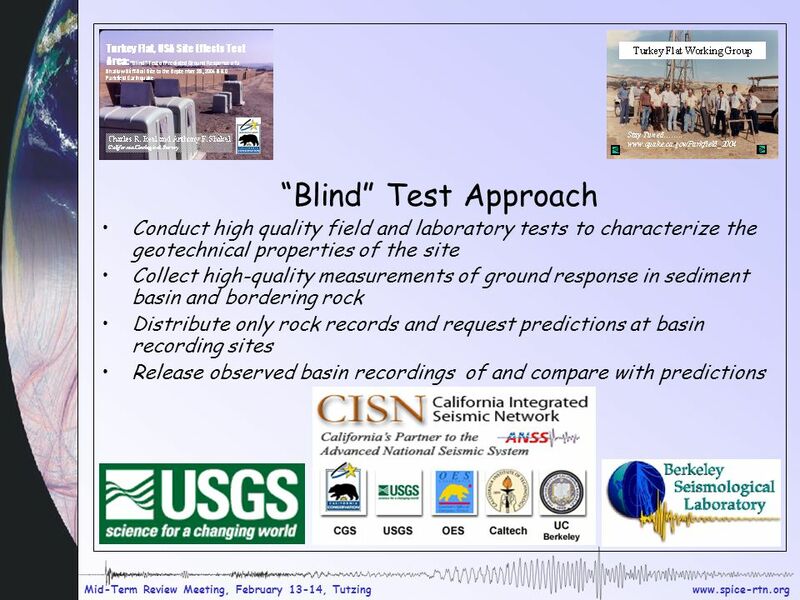 Charles R. Real and Anthony F. Shakal California Geological Survey Turkey Flat, USA Site Effects Test Area: Blind Test of Predicted Ground Response of. A Pseudo-Dynamic Rupture Model Generator for Earthquakes on Geometrically Complex Faults Daniel Trugman, July 2013. 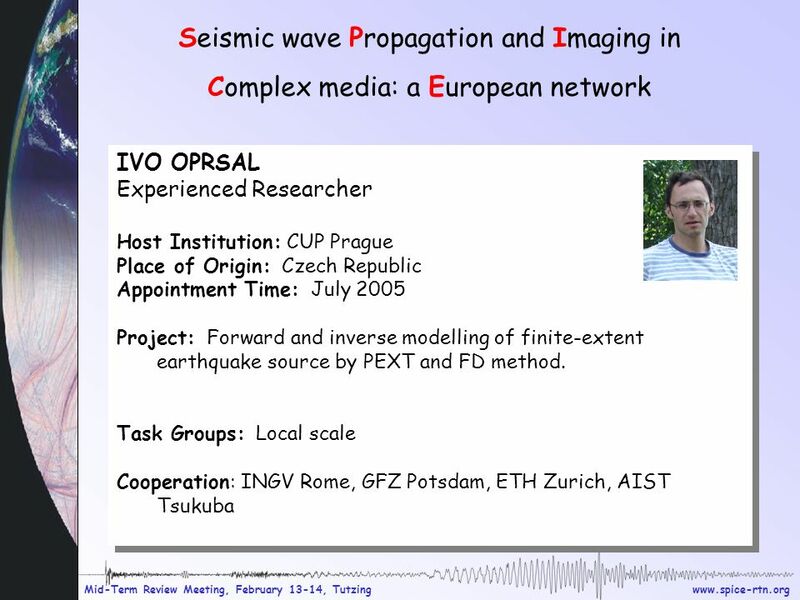 Mid-Term Review Meeting, February 13-14, Tutzing Seismic wave Propagation and Imaging in Complex media: a European network JEAN BATTAGLIA. 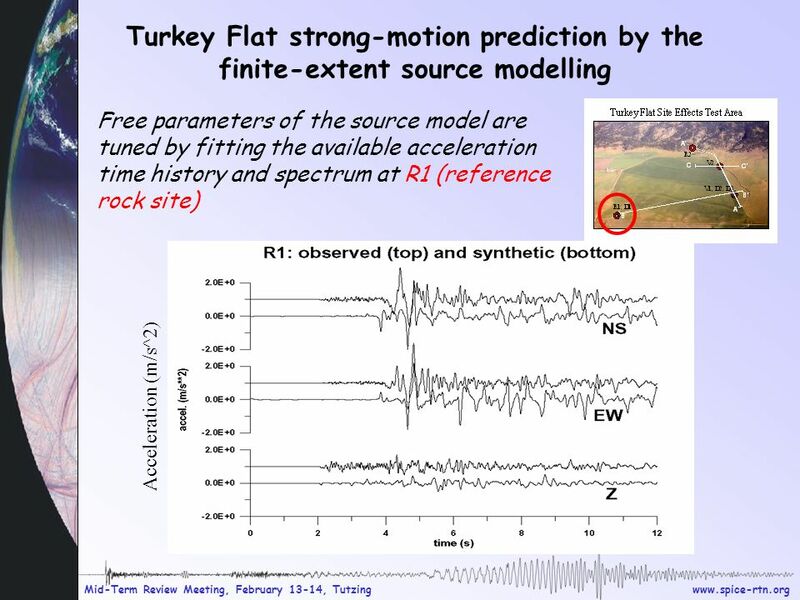 Numerical methods in the Earth Sciences: seismic wave propagation Heiner Igel, LMU Munich III The latest developments, outlook Grenoble Valley Benchmark. SPICE Research and Training Workshop III, July 22-28, Kinsale, Ireland Seismic wave Propagation and Imaging in Complex media: a European. A DECADE OF PROGRESS : FROM EARTHQUAKE KINEMATICS TO DYNAMICS Raúl Madariaga Laboratoire de Géologie, Ecole Normale Supérieure. Tom Heaton Caltech Geophysics and Civil Engineering. Geol 600 Notable Historical Earthquakes Finite fault rupture propagation rohan.sdsu.edu/~kbolsen/geol600_nhe_source_inversion.ppt. Average properties of Southern California earthquake ground motions envelopes… G. Cua, T. Heaton Caltech. 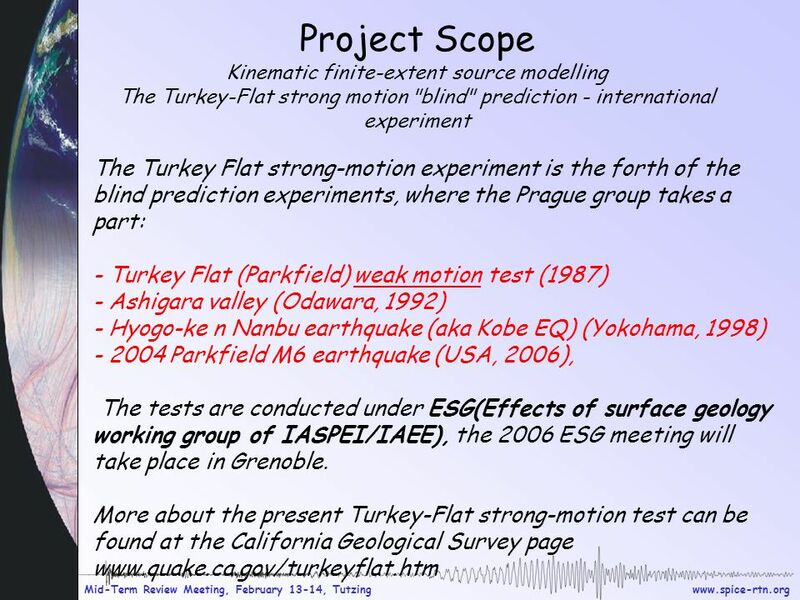 11/02/2007PEER-SCEC Simulation Workshop1 NUMERICAL GROUND MOTION SIMULATIONS: ASSUMPTIONS, VERIFICATION AND VALIDATION Earthquake Source Velocity Structure. 5: EARTHQUAKES WAVEFORM MODELING S&W SOMETIMES FIRST MOTIONS DON’T CONSTRAIN FOCAL MECHANISM Especially likely when - Few nearby stations, as. 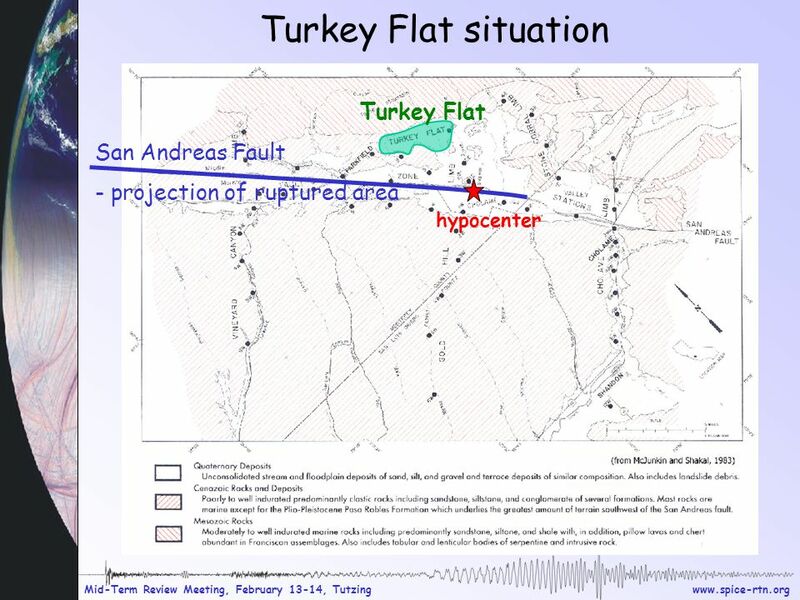 Lecture 16 Earthquakes What are earthquakes? Elastic rebound theory Waves generated by earthquakes: P waves, S waves, Surface waves Locating earthquakes. VII. Earthquakes A.Introduction B.Source of seismic energy C.Propagation of seismic energy D.Recording earthquakes E.Magnitude scales.